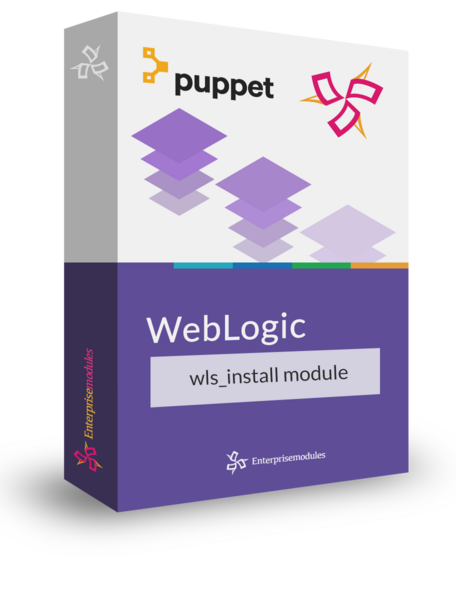 The wls_install module contains the classes, defined types and custom types to install WebLogic on your system and to create a very basic domain using the Puppet descriptive language. Checkout our full documentation of this module at our documentation site It doesn’t provide any means to configure the server. When you want to manage WebLogic objects like queue’s datasources and managed servers, you’ll need the wls_config module. as well. With the purchase, you are entitled to run this module on one node and get support and maintenance. The entitlement period lasts for twelve months. To use the Oracle software you need a separate license provided by Oracle Inc. Check the Oracle price list to buy a valid license for your system(s). This Puppet module allows you to install Oracle WebLogic and other products in the Oracle Fusion Middleware family. The modules also allow you to pack a domain and copy it to an other node in a cluster.